I'm going to say this right up front because I know most of you don't even read past this first paragraph. Tag is easily one of the funniest movies I've seen in years. I was not expecting that going in, but coming out I had laughed so hard my stomach hurt. Is it an instant classic? I'm not sure, but man is it funny. Oh, also, it has the perfect concept for a Hawkeye movie so Marvel should get on that. Tag is one of those based-on-a-true-story movies about a group of friends who have played the same game of tag for nearly 30 years. Every May the game opens back up for one month and the friends kick into high gear with ever more elaborate pranks to tag each other. Hogan (Ed Helms), Bob (Jon Hamm), Randy (Jake Johnson), and Kevin (Hannibal Buress) have all been "it" plenty of times, but their friend Jerry (Jeremy Renner) has never been tagged in the history of the game. He's too fast and too good at tag you see. But all that is about to change as Hogan informs the guys that Jerry is about to quit the game so Jerry's wedding is the last chance they will have to tag him... ever. It's a ridiculous premise to play with and the movie knows that, turning it into a quick-talking, slapstick cartoon that feels somehow perfectly childish in tone. 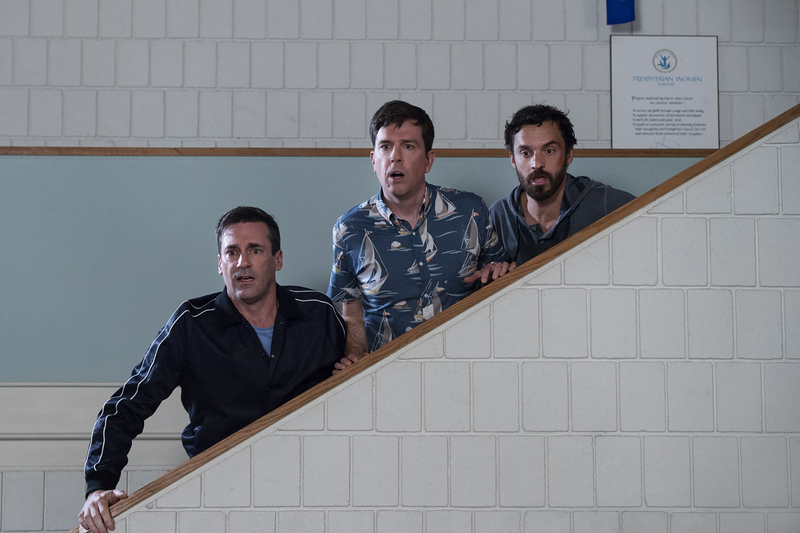 Yes, the comedy can be juvenile at times and even veers to gross-out humor, but director Jeff Tomsic, who spent most of his career in television, toes the line between disgusting and funny wonderfully. The slapstick humor pushes into cartoonish, which is alwasy a risky gamble when dealing with live action, but it works as Tomsic gives off visual cues almost every time these moments are happening, an extended horror film section kicks off by muting all the movie's colors for example. The end result is a humor that reflects the movie's themes of staying young at hear while also be incredibly crass. There's also the dramatic shift in tone whenever the four guys attempt to tag Jerry, who is basically Hawkeye without arrows and can easily pull off dramatic ninja movies to avoid being tagged (again, a childish slant played seriously). For these moments the movie kicks into a Sherlock Holmes style slow motion, where Jerry narrates the actions he's taking to dismantle his friends. All you will be thinking during these sequences is why Marvel hasn't made a damn Hawkeye film exactly like this, where Hawkeyes is basically a super ninja with a bow and arrow and just destroys fools in slow motion. And speaking of superhero movies, I know Renner's arms were digitally put in, but DC needs to take some notes because damned if I knew when. It's not these slapstick moments that most of the humor derives from, though. It comes from the cast's ability to bounce off one another wonderfully. Helms, Hamm, Johnson, Buress, and Renner all play off each other hilariously, delivering lines like it's part of their normal conversation and hitting their timing in fantastic stride to pull laughs. Their interplay never feels forced, and Buress especially delivers some fantastic lines. The comedy between these five guys can often be cruel too, but it never feels mean. The movie actually pushes kind of dark with its tone at points, but it all seems to reinforce its less comedic message of tag keeping these guys young at heart. That, in the end, is what makes Tag tick. Like all the best buddy comedies it's about the group of friends, not the actual gags. Tag's ability to weave in that story of friendship while still playing more cartoonish than your average bromance is why it works. It feels somewhat different from the usual comedic fare -- like an early Apatow film, but with some Laurel and Hardy mixed in... and maybe some Tom and Jerry too. I don't know if Tag ever reaches the emotional heights of some of the better bromances out there, and I don't think it's really trying to. This is a comedy first and everything else second, but it works. You laugh a lot. Most of its pull comes from the charms of its stars, but there's definitely something special about it too. Tag is just really funny.